Although December is a dark month with short days and the longest nights, traditionally it is always lit up by seasonal festivities. Christmas lights and decorations, displays in shop windows, gift wrappings etc all add a glitter and glow to the darkness. This year, there's a lot of glitter and sparkle in fashion everywhere, to be seen in clothes, accessories and jewellery. There are even sparkly boots! ✭Yves Saint Laurent BLACK OPIUM Eau de Parfum, a "glam rock" fragrance - mysterious, addictive, edgy with notes of black coffee, white florals and sweet and sensual vanilla, it's really in the mood. Even the design of the spray bottle and the box exude dark glitter! ✭the dark romance of a sheer black lace top with ruffles - just add sparkling earrings to provide the glitter. 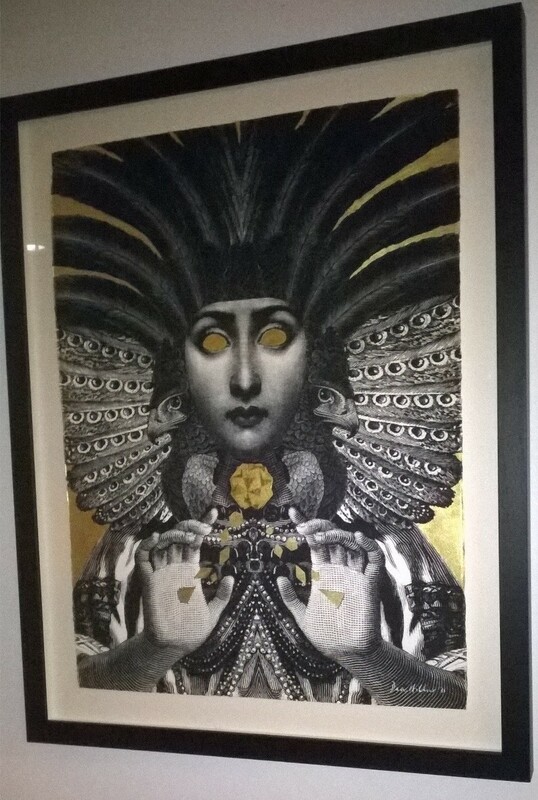 Earlier this month, I really enjoyed going to a private view of Ceremony, an exhibition of new works by Dan Hillier at the Saatchi Gallery. Inspired by his recent travels to the Amazon rainforest and working with shamans, the artist has created a collection of beautiful, mystical prints. I loved the dark pen and ink etchings and hand-applied 24 carat gold leaf.